The City of Federal Way strives to create an accessible environment in our general recreation programs for our diverse population. People of all abilities are invited to consider registering for any recreation program Federal Way Parks has to offer provided minimum eligibility requirements are met. To request an accommodation please allow 10 business days prior to the start of the course and fill out this form Inclusion Request Form (pdf). We also offer programs designed specifically for people living with disabilities in our Inclusion Programs listed in our quarterly brochure. If you have any questions about accessibility in any of our programs, contact Kevin Hutchinson at kevin.hutchinson@cityoffederalway.com or 253-835-6927. 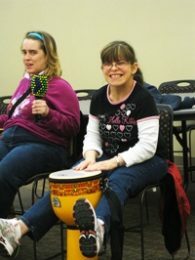 We offer an array of life-skill courses aimed at promoting independence, enhancing social skills, educating participants, and promoting a healthy life style. Course offerings include: Arts & Crafts, Therapeutic Drumming, Fitness, Theatre, Cooking, Special Olympic Sports, Social Clubs, Day Trips & Overnight Trips, Nutrition, Personal Safety, Job Skills, Personal Finance, Therapeutic Gardening, Reading Clubs, and more! Quality of Life – Through inclusive recreation programs, an individual gains positive feelings of self-worth and personal growth. Our programs also focus on a healthy lifestyle that helps promote personal wellness. Social integration helps participants grow as individuals and provides self-satisfaction. Finally, support, accommodations & assistance are provided to individuals to help facilitate a positive experience in our programs. Removal of Barriers – Attitudinal barriers are minimized through education, staff training, and interactions between participants with and without disabilities. Physical barriers are eliminated to help facilitate participation by people of all abilities. Finally, our programs encourage the ideas of “risk taking,” personal growth, personal choices & social integration to help encourage an inclusive environment. Interaction Within Our Community – Our trips are designed to help foster social interactions of our participants with the community as a whole. We offer a full array of activities in diverse settings which help to educate our participants and other citizens of Federal Way. These interactions will help to provide positive future notions of people with disabilities.